Our performance has gone down due to being late for classes and having to go to the water supply to look for water. As we moved to Our Lady of Peace Girls Secondary School in Nandi, we found well dressed and neat girls. There came a smiling girl known as Aliceson Cherop who is in fourth form and the outgoing Sanitary Prefect. She comes from Cheplasgei village in Eldoret Town. Her hobbies are Singing, Reading novels and interacting with other students on academic issues and aspires to excel in her exams and become an Engineer. Cherop is the first born to a humble family of three. Her farther works as an Administrator of Living Streams Kisumu and her mother is a Businesswoman in Eldoret town. 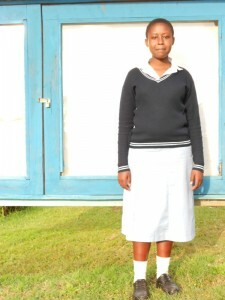 Her determination in school made her excel in her exams and joined Eldoret Girls Secondary School. In form two she left Eldoret Girls and joined Our Lady of Peace Girls Secondary school and was really surprised by the population of 500 girls which is smaller compared to the school she had left previously. “It’s been really hard for me,” says Cherop. Amidst laughter, she says that as a Sanitary Prefect she has many cases where the girls steal water from each other. “Why the laughter?” I ask. She replies, “It’s funny that girls can steal water from each other and this are the cases I handle every day as a prefect. I would wish to tackle other Sanitation issues but it all Zeros down to water.” Cherop says that supervision becomes hard because she can’t force the girls to work when there is no water to use. “Our performance has gone down due to being late for classes and having to go to the water supply to look for water,” she laments. Cherop says that the school has been since losing many girls to other schools because of lack of water. The school’s population has reduced from 500 students from when I joined our Lady of Peace to 226 currently due to the scarcity of water in the school. She claims that the girls are happy during the rainy season as they collect the rain water from the roof catchment. Despite the difficulties to access water, Cherop takes her role as a leader and encourages other students to always work hard. She and the other girls are happy because BWP will be drilling a well in the school. Her hope is that as she finishes her fourth form, the remaining students will have access to safe and clean water and that they can improve in their Academics. When you invest in The Water Project, you're investing in people like Aliceson Cherop. Your gifts help us reach more communities with the gift of clean, safe water. And every drop helps unlock potential.